Display the sun’s position and path relative to the model at any date, time, and location. View shadows over the model, isolate individual shadows from selected objects, and assign colors in order to differentiate the effects of different objects or buildings. See how sunlight enters through windows and moves within a space. Tag objects in the model as solar reflectors and track movement of reflections across the site. Calculate daylight factors and illuminance levels at any point in the model or over the analysis grid. Once you calculate daylight factors in your model, use the advanced daylighting features to help determine potential savings due to daylight-linked lighting. Analyze site projection angles, assess obstructions, calculate vertical sky components for any point or surface, and visualize the no-sky line in any space. Generate angled test planes from each window or facade you are studying, or physically project and color exactly the parts of a structure that are infringing. Acoustic analysis options range from simple statistical reverberation times to sophisticated particle analysis and ray tracing techniques. Calculate heating and cooling loads for models with any number of zones and with any type of geometry. Assign detailed material properties to all objects and annual hourly operational schedules to occupancy, internal gains, infiltration, and individual items of equipment. 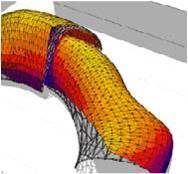 Generate geometry and analysis grids and export them directly into computational fluid dynamics (CFD) tools. Complete your calculations and import results back into Ecotect Analysis for display within the context of the original model. Choose from a variety of visualization and presentation options, or view volumetrically as you move around in 3D. Use the same process to calculate airflow both through and around buildings and complex urban environments.